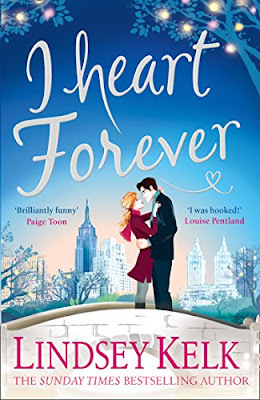 Book Review: I Heart Forever by Lindsey Kelk. It has taken me a hot minute to write this book review and for that I am so so sorry. I have been a lot slower than Kelly recently in trying to keep up and catch up with reading and reviewing. Furthermore, Lindsey very kindly sent me this book over Summer, when I was very much struggling to want to do anything, so when I finally picked up the book and found that Angela was a welcome distraction, I think I disapeared into my own little world so much that putting my thoughts in to a review was a little tricky. Books have the ability to transport us to another world. They can make us happy, sad, scared or they can inspire us, lift us up and make us learn something new. No book is the same for any one person and I think that is fascinating. I have loved Lindsey Kelk for a very long time, ever since I picked up I Heart New York, many moons ago, and I have followed this series since then. I simply adore it. I was beyond excited when she announced I Heart Forever and incredibly touched when it appeared through my letter box this past Summer. It was a little piece of happiness at an extremely difficult and dark time. For that I am forever grateful to Lindsey and her team at HarperCollins. So, first things first, now that I feel ready to dive in to this wonderful read, if you haven't read any of the previous I Heart books you need to get on that like yesterday!!! Chop, chop!!! They will make for the perfect read over the holidays, so I suggest you get them all and start from the beginning, curl up by your Christmas tree and jump in. You won't regret it. They are all utter fabulousness that you need in your life!!! In I Heart Forever, we meet back up with Angela Clark as she's gearing up for the holiday season in her own spectacular way. Her husband, Alex, is back packing round the world and her fashion magazine is about to go through some big changes. In addition, she is trying to keep a huge secret from her best friend and an even huger secret from her boss and her colleagues. Angela Clark is one of my all time favourite leading ladies, I freaking LOVE her. She makes me smile so much. I love that she runs a magazine and can be all girl boss in her own unique, sometimes frazzly way. She had me in stitches in so many parts of this story as her humor and things she comes out with is just on point and so my kind of style. I love that she is into her fashion, yet she doesn't have it all or get too crazy always buying clothes or accessories, she wears things in and pieces hold sentimental value to her, like with her beloved bag, and this just makes her more real to me and relate-able. Her relationship with Alex is one of my all time swoon worthy must reads. I am besotted with them both and think they make for such an enjoyable, romantic and real read. This story pulled at my heart strings when she had to cope without him for so long. I could feel Angela's pain and was counting down the days with her for Alex to get back. As for Angela's best friend Jenny, she is always a hoot. I love that she is whirlwind of energy and I really love that her journey is so different to Angela's but the girls are forever supportive, encouraging and there for each other no matter what. What happens to Jenny in this book makes my heart happy too. Furthermore, Jenny is full of laugh out loud moments that will just make you love her even more. You need to pick up this book! I Heart Forever is another wonderful and magical read from Lindsey Kelk. It will make you fall in love with New York, inspire you to work and love as hard as Angela, get your style in check like Jenny, look after your friendship circle and also stand up for what you want in life. And...possibly message your husband and tell him that the whole being away from each other will just not do...and possibly start talking to him about having kids. :p I'm a romantic, what can I say? I adore Angela and Alex. Go and buy I Heart Forever now! !